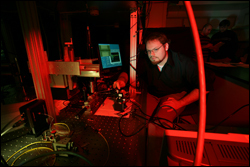 Grad student Nathan Siwak works on the nanoscale sensor project. Chitosan, a substance found in crab shells, is the key component in a nanoscale sensor system developed by Associate Professor Reza Ghodssi (ECE/ ISR) and graduate students Nathan Siwak, Sephan Koev, Jonathan McGee and Mike Fan in the MEMS Sensors and Actuators Lab. The sensor can detect minute quantities of explosives, bioagents, chemicals, and other dangerous materials in air and water, potentially leading to security and safety innovations for airports, hospitals, and other public locations.